"I've never been to Texas before." 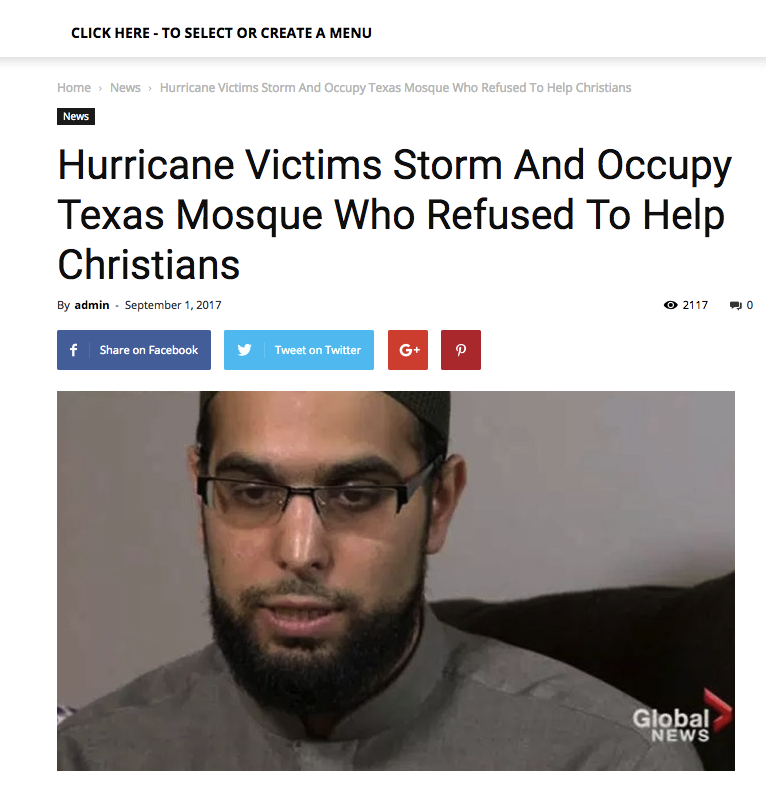 Toronto imam Ibrahim Hindy was pictured in articles saying a mosque in Texas denied shelter to victims of Harvey. Hindy has never been to Texas. While completing a pilgrimage to Mecca, his phone was filled with messages from friends sending him the article. 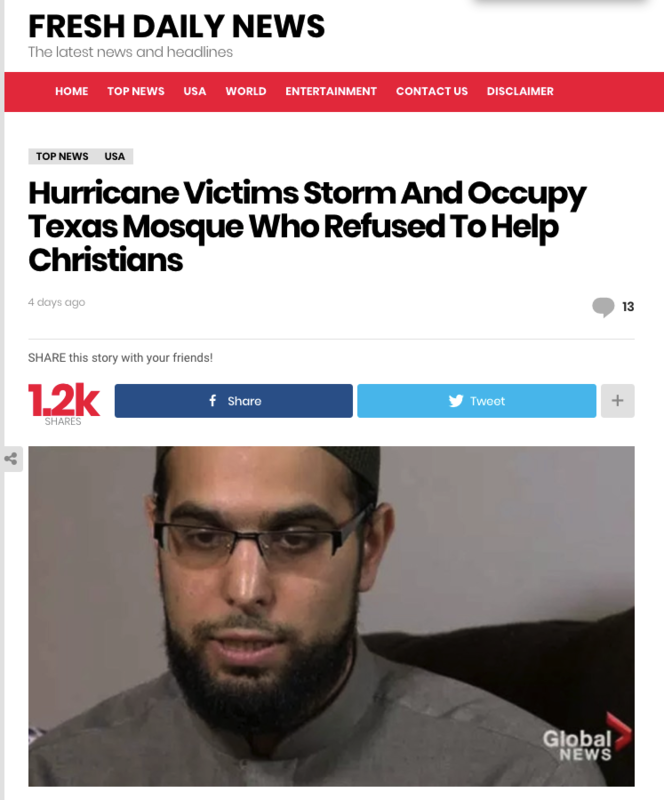 The post said victims of Harvey stormed a mosque that wouldn't allow them in, but it's not true. In fact, many Muslim Houstonians have been working to help victims of the deadly storm. It was published on The Last Line Of Defense, a site that says everything on it is satire. The Last Line Of Defense made up all the names in the article, which got over 2,000 likes, shares, and comments on Facebook, according to social tracking tool BuzzSumo. The site is run by Christopher Lyman, also known as Busta Troll, who told BuzzFeed News a writer for the site found the image. "It was a random Google search for a Muslim man outside the US," Lyman said over Facebook Messenger. The Last Line Of Defense has since replaced the image and posted an apology to Facebook. However, other sites copied the story from The Last Line Of Defense. They still used Hindy's image and did not include a disclaimer of the post being satirical. Hindy told CBC News that the whole thing has been a surreal experience. "But as I thought about it more, I thought this is the kind of thing that can actually be dangerous," he said. "It's going out there, it's inflaming emotions, it's getting people riled up on the basis of things that are completely false and completely made up. And frankly, someone could see my image there and think that I'm this terrible person and come after me." A previous BuzzFeed News analysis found that Macedonian fake news sites frequently steal posts from The Last Line Of Defense, though many of those pages were taken down as a result of Lyman reporting them. Lyman told BuzzFeed News he didn't want to get into the morality of his work. "I expose hate. My methods are extreme and they are what they are," he said. "And as it exploits their [the readers'] fear of Muslims, they will also share the fake story, get smacked down by their friends and maybe learn to use Google once in a while." This isn't the first Houston-related story adapted from The Last Line Of Defense. A false story about Black Lives Matter "thugs" blocking aid to victims was also duplicated and spread despite BLM activists helping people in Houston. Here are the fake news and scams about the deadly storm in Texas that have been circulated around the internet.